(NewsUSA) - Sponsored News - Just in time for Earth Day, a new book introduces young readers aged 7 to 11 to a whole new world of unique and compelling endangered species, environmental awareness, teamwork and, best of all, a rollicking, outlandish group of characters that entertain the whole family. The Nocturnals: The Mysterious Abductions, by Tracey Hecht, focuses on a group of animals who form an unlikely team to solve the mystery of why other nocturnal denizens of their forest are disappearing. Dawn the fox, Tobin the pangolin and Bismark the sugar glider embark on a fantastic adventure that takes them to the depths of the earth and places their survival at stake. The book is aimed not only at children, but at their parents, and is written with an ear toward being read aloud to educate all ages about the importance of protecting animals and the environment. The story combines snappy dialogue with plot twists and action, and slips in education about different types of animals and how they live and behave. Author Tracey Hecht noted in an interview that the benefits of shared reading aren’t limited to pre-readers. “I didn’t stop reading aloud to my kids -- I still haven’t -- and it’s the best part of my day,” she said. “I keep books everywhere and I think of reading like a conversation -- just have it. Just pick up a book and have it. You’ll be amazed at how well it bridges the gaps,” she emphasized. 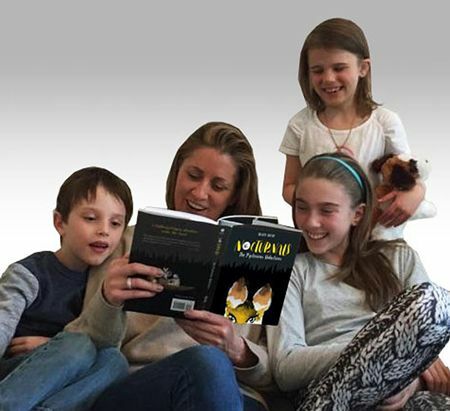 Children, parents and teachers can visit www.nocturnalsworld.com for more information about the book, including a sample chapter that introduces the main characters. In addition, the website offers bonus animated shorts, activities and educational materials, including a Next Generation Science Guide, templates for animal trading cards and library resources including guidelines for middle grade book clubs.